The dental facelift works to reverse the effects of aging on the face by using dental veneers to add volume or length to teeth. As we age, muscles in the face loosen and teeth become worn down. An effective way to correct this is by building the teeth back up. This simple addition of dental veneers creates desirable results seen in the entire face and not just when you’re smiling. The procedure is non-invasive, making it a less intimidating alternative to injections and the traditional facelift. With the artistic and precise work of The Paddington Dental Surgery team, porcelain veneers are shaped to add fullness to patients’ smiles, while still providing a completely natural look. In addition to enhancing your natural beauty, it is possible that your dental facelift treatment plan will improve your oral health as well. If you have existing health concerns, we can help address those before beginning your dental facelift procedure. Our dedicated team of dental professionals is committed to providing exceptional care that takes into consideration your whole health. We believe that wellness and aesthetics can exist side-by-side—you should never have to choose between the two! Who Is a Good Candidate for a Dental Facelift? Many individuals can benefit from a dental facelift. This procedure is designed to rejuvenate your appearance by enhancing the aesthetics of the teeth and gums. Therefore, you will be best served by this treatment if you have common signs of aging that can be softened by improving the shape, size, and quality of your teeth. If you are bothered by teeth staining, thinning lips, facial volume loss, and deep creases, a dental facelift may be able to help you minimise these concerns. A dental facelift is not a surgical procedure, but it can have dramatic effects. 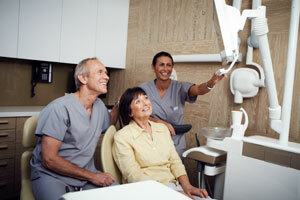 Furthermore, any oral health issues can be identified and addressed prior to beginning. Like with any procedure, your dental facelift will be customised to your unique needs, and only what you wish to change will be addressed. In practically no time at all, you can have the refreshed look you desire. How Long Does the Dental Facelift Process Take? One of the many benefits of a dental facelift is the relatively quick experience. Our experienced team of cosmetic dentists can typically complete the dental facelift process in as little as two appointments, sometimes three, each scheduled one to two weeks apart. In your consultation, we will establish your goals and your dentist will reveal what work needs to be done. Once your treatment details have been determined, your dentist will let you know what the expected timeline should look like. If you add on supplementary procedures, the process could take longer, depending on what techniques are used. What Does the Dental Facelift Procedure Entail? When it comes time for the procedure, your dentist will walk you through what steps are being taken to reach your goals. It is our philosophy to keep you informed about your progress at every stage so you feel empowered to make the best dental decisions for you. The process will begin with your teeth being prepared into the ideal size and shape to support your custom veneers. After this preparation, you will receive temporary veneers while your custom permanent veneers are being fabricated with the help of a Master Ceramicist. At your final appointment, the custom-designed veneers will be affixed to your natural teeth, leaving you with a bright new smile. What Can I Expect During My Dental Facelift Recovery? Since no surgery is necessary during the procedure, there is no recovery time needed. Overall, the dental facelift proves to be a convenient procedure that provides our patients with long-lasting results. How Long Will My Dental Facelift Results Last? The longevity of your dental facelift results cannot be guaranteed, as a number of factors will ultimately affect your results. In many cases, dental veneers can last for 10 years or more before they need to be replaced. Keep in mind, however, that over time you may develop additional signs of aging due to facial tissues becoming more lax. Fortunately, patients can expect to continue looking younger than they would have had they never undergone the dental facelift procedure. To help preserve your dental facelift results for as long as possible, you should care for your veneers the same as your natural teeth—by practicing good oral hygiene with regular brushing, flossing, and dental visits. In addition, it is best to avoid hard or sharp foods that can cause abnormal stress on the teeth. With the proper maintenance, you can expect your dental facelift results to last for several years. How Much Does a Dental Facelift Cost? The cost of a dental facelift will vary for every patient based on the specifics of their procedure. After your treatment plan has been established, our team will provide you with a personalised quote for how much you can expect to pay for your dental facelift. This will include the fees from your dentist and ceramist as well as the cost of your veneers. There are many similarities between these three popular treatments, but what makes them distinct is very simple. A dental facelift is intended to give the patient a more youthful appearance. A Smile Makeover uses primarily cosmetic techniques to enhance the beauty of the smile. And full mouth reconstruction combines multiple restorative procedures to improve the health and function of the oral structures. These terms help you determine which approach is ideal for your desired outcome, but each one can be personalised to accommodate your preferences. Not sure which one is right for you? Our friendly and knowledgeable team will perform a thorough evaluation and discuss your goals before recommending options that can help you obtain a beautiful and healthy smile.